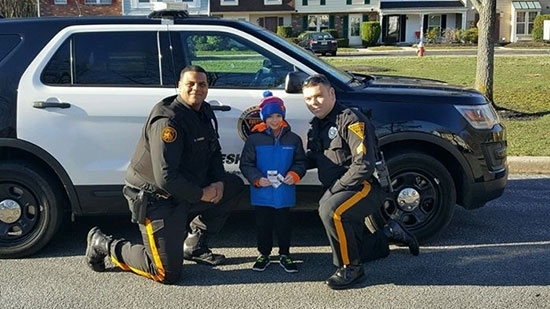 Evesham Township Police are hailing a 7-year-old boy a hero after he helped saved his mother's life by dialing 9-1-1. On Friday morning, March 3rd, as they were getting ready for school, mother Danielle Regalbuto suffered a severe asthma attack and was on the floor gasping for breath. She handed her son, Rocco, the phone and told him to dial 9-1-1 as they practiced because of her condition. "I asked who do I call? She said 911. So I called 911 and explained everything that happened," said Rocco. He calmly told dispatchers what was happening and answered their questions. When medics arrived he was comforting his mother. Danielle was rushed to the hospital and is in stable condition. Rocco went to school and wore his favorite Superman hat. When asked about how he felt he said, "A little nervous and a little like a hero." In a Facebook post the Evesham Townshop Police said, "If it were not for the brave and educated actions of this 7-year-old boy, this might have ended tragically! We think he is very special and reminds us all of the importance of children knowing how to dial 9-1-1!" Police are investigating after an explosion of gunfire in Philadelphia's Logan section injured a man and riddled an occupied school bus with bullets. It happened just before 4:30 p.m. near 19th and Wingohocking. Four men with ski masks jumped out of a red vehicle with heavy tint carrying semi-automatic weapons and began to fire. Police say that 42 shots were fired. A 57-year-old man suffered a gunshot wound to his left ear and was transported to Einstein Hospital in stable condition. The school bus was hit 8 times, some of the bullets going straight through the vehicle. Surprisingly, the 45-year-old woman driver, her 27-year-old daughter and a 13-year-old girl onboard were not injured. The four men fled the scene. No arrests have been made. The motive is not clear at this time. Police in Montgomery County are investigating a hit-and-run accident that killed one person on Friday. It happened early Friday evening on Route 100 near Shoemaker Road in Pottstown. A man was struck by two vehicles. One vehicle stayed at the scene, the other fled. The man was pronounced dead at the scene. Police are searching for the fleeing vehicle. UPDATE: Authorities have identified the victim in the hit-and-run as 24-year-old Donald Purnell. Purnell was walking to his job at Wendy's when he was struck by a dark-colored pickup truck traveling southbound on Route 100 just before 8pm. The truck fled the scene. Purnell was struck again by a second car while lying in the street. The second driver stopped and told police he didn't see Purnell.